The world’s first quad rear camera setup smartphone “Galaxy A9” is finally here. We pitied the smartphone against the Galaxy Note 9 to see which one is better in terms of specifications. The Samsung has recently launched its first ever quad rear camera setup smartphone in India, Samsung Galaxy A9. Samsung has decided to start the trend by providing the four cameras on its mid-range segment smartphone instead of going with its flagship devices. On the other side, the Galaxy Note 9, which is starting from Rs 67,999 comes with an improved S pen and AI cameras. 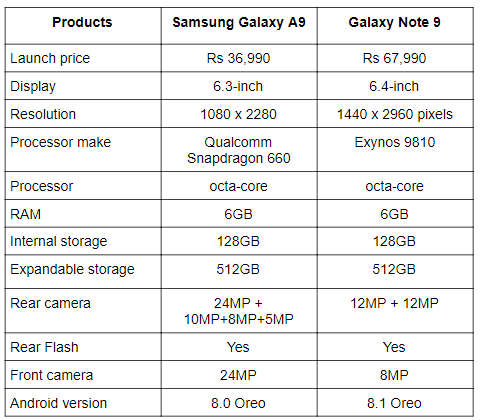 So, let’s begin with the quick specification comparison of the two to know which one provides the best when it comes to hardware. Let’s start by comparing the display of these two smartphones in detail. The Samsung Galaxy A9 sports a 6.3-inch display that offers a resolution of 1080 x 2280 pixels. On the other side, the Galaxy Note 9 comes with a slightly bigger 6.5-inch display that offers a resolution of 1440 x 2960 pixels. 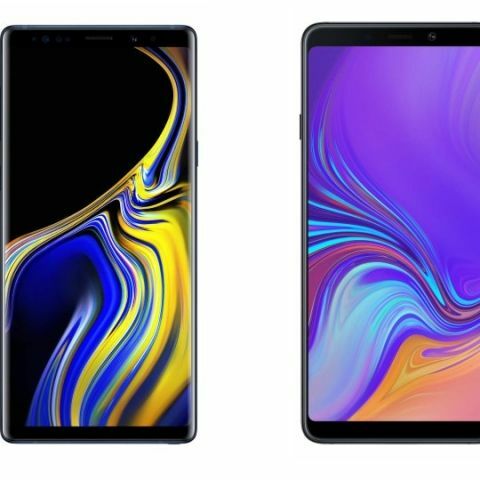 When it comes to the processor, the Samsung Galaxy A9 is powered by a Qualcomm Snapdragon 660 processor, while the Galaxy Note 9 is equipped with an Exynos 9810 octa-core processor. Coming to the cameras, the Samsung Galaxy A9 is the world’s first quad rear camera setup smartphone, which features a quad 24MP + 10MP + 8MP + 5MP rear camera along with a 24MP unit on the front. The Galaxy Note comes with a dual 12MP rear camera with an 8MP sensor on the front. The Samsung Galaxy A6 is available in India at Rs 36,999, while the Galaxy Note 9 is priced at Rs 67,999.